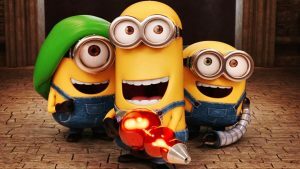 The Minions (2015) produced by Illumination Entertainment and distributed by Universal Pictures receives three stars. One for each other main minions, Kevin, Stuart and Bob. If I gave one more they would inevitably fight over it and while no dead body or consequence would be shown…we’d know what happened. The Minions are pseudo-educational creatures. They show you what not to do: Say “Idiot”, hit people, kill people, use weapons…and they show some very admirable quantities: perseverance, loyalty and friendship. Is it minion-licensing? Working cooperatively in service of the most evil character they come across…T-Rex, Napoleon and now Scarlet Overkill, finally to be team Gru. They grew! The minions point out the gray nature of human nature. It’s easy to say someone is evil. It’s harder to say that a person has done some evil things but has some very redeeming qualities and potential. The minions manage to make evil cool, and simultaneously make evil less evil. Minions do not quite accomplish the mission of making good behavior cool. Because their mission stands clear: serve evil. The heart of service is nice; the evil not so much. I’d bet a hitting-toddler would laugh harder after hitting their Mama-master after watching the Minions. Maybe the Mama laughs, too? The universal quality of the minions is pretty remarkable. Coming from the one-celled organism the minions are heralds of science! Or pseudo science. Very similar to toddlers with adult tenacity – world traveling and self-sustaining with whining and a “mine” mentality. The minions definitely are not politically correct. Like the bad habit most popular in the 1990’s and 2000’s, “that’s retarded” which uses a medical diagnosis as synonymous with “stupid”…the minions too, dumb it down. Let’s hope the Minion tribe is not the pictured version of that un-clever, fading saying. 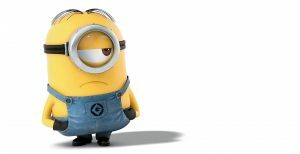 If not further marginalizing a part of society the minions at least stand for the white male privilege, right? The yellow emoji also standing for a white person, does it not? Perhaps more evidence is needed for that claim. The white male race serves the highest evil master around, but the master turns around and adopts little girls? Okay…okay. Three star worthy critique of history. For a child it still may perpetuate something. The character design of the minions holds a classically phallic form. They are reminiscent of so many famous, familiar characters that it’s automatic for the minions to be popular. You almost already know them! No, not from Despicable Me. Take the three stooges for example. Larry, Curly and Mo? Kevin, Stuart and Bob? The slapstick does it. The yellow bodies can’t help but scream “Simpsons!” and brings to the Minions the satirical edge. The minions can easily say, like the Simpsons, the do not endorse what they depict: violence with sexual undertones. Minions are critiquing those things. Only the Simpsons actually spoke, are much more intelligent and more believable on that count. How about bananas in pajamas? Mike from Monster’s Inc? The voices are a contemporary remake of Alvin and the Chipmunks helium shenanigans remixed with baby talk. Minions are walking renditions of Sigmund Freud’s Id, and the humans have the Ego down pat and the plot can have a twist because both can display elements of a Superego out of nowhere! That part is sneaky. Does a child walk away with an enhanced superego or an enhanced Id?